A fellow dog walker told me he was sure he'd seen a monkey swinging from a tree in the plantations. It was near the path where the pigs had their first home. 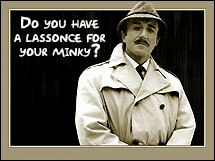 you do know what a minky is TTS? Remember the monkey that escaped from the zoo at Haigh Hall, it was seen in the plantations and the poor thing got whacked to death with a spade, thankfully vets now have tranquillising guns. I'd forgotten all about the zoo. When did it close And didn't we once have a butterfly house . Well. Many, many years ago as a teenager I was in my car one VERY late evening in Leyland Mill Lane with a lady friend, (just star gazing, honestly) and I peered out of my window to see a chimpanzee sat in the middle of the road looking at us. The next day I went to Haigh Hall zoo to report this and was told that it wasn't one of theirs but Tom Whalley who lived nearby had chimps and it could have been one of his. I don't know if that was true but my part of the tale certainly was.